We are sad to let you know that our sister, Deborah Parr Emery, passed away from staph pneumonia on April 20, 2013, in San Luis Obispo, CA. She had not been in good health for many years due to complications of knee replacements and had suffered repeated bouts of pneumonia. In spite of all that, she had become a psychiatric nurse practitioner as her second career. She was employed with the California Men’s Colony in Atascadero, CA, and she specialized in working with prisoners recovering from drug and alcohol addiction. Deborah’s best friend, Carole, had passed away in February. They are both missed by their many friends in Seattle and California. Their dogs have been adopted by good families. 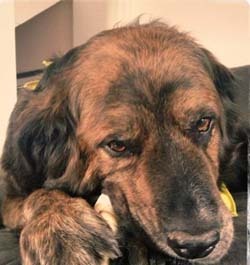 Below is a link about Deborah’s big dog, Gus, who was recently diagnosed with lymphoma. Debbie's dog, Gus, was adopted by a loving couple after her death. They soon learned that he had lymphoma and are struggling to provide him with the chemotherapy he needs to survive. Every little bit helps.